If you are using Satnav, please use the postcode GL8 8SB, which will bring you to the Clubhouse via the correct entrance. 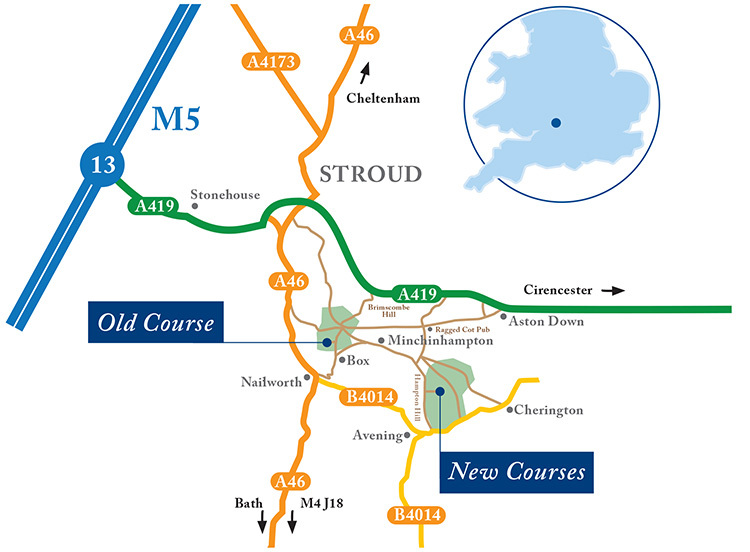 Travel to Cirencester then take the A419 towards Stroud. On seeing Aston Down airfield on the left take the 1st left at the roundabout signposted Minchinhampton. After two miles, turn left at the Ragged Cot public house and continue through Hampton Fields. When faced with a T junction turn left towards Avening, and see the Golf Course on the left after half a mile. Travel via the M5, Junction 13 to Stroud, or via the A46 from Cheltenham to Stroud. From Stroud take the A46 to Nailsworth. Take the B4014 to Avening - 2.5 miles. In Avening take the left fork at the Queen Matilda public house, towards Minchinhampton. In half a mile see the Golf Course on the right hand side. Take the M4 to Junction 18, then the A46 north to Nailsworth. Take the B4014 to Avening - 2.5 miles. In Avening take the left fork at the Queen Matilda public house, towards Minchinhampton. In half a mile see the Golf Course on the right hand side.